Dynamic by Nature was born out of Judy Chamber’s desire to inspire the world with her passion for healthy living and healthy eating. Judy Chambers is a graduate of the Canadian School of Natural Nutrition, a professional member of the International Organization of Nutritional Consultants and is a Nationally Certified Personal Trainer. She focuses on natural living as a dynamic evolving path, integrating her expertise in physical fitness – specifically core conditioning and functional strength – along with her natural nutritional consulting practice where she engages our awareness of the food we eat as an essential indicator of our overall health. Judy uses principles and assessment techniques from Eastern Medicine, alongside a careful interpretation of modern science and an intuitive sensibility for holistic living. She is also a playful gourmet chef who infuses natural foods with taste, style and – most importantly for the modern multi-taskers - ease. 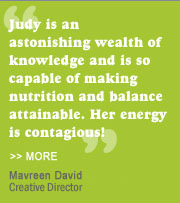 Judy lives in scenic, active Kitsilano, Vancouver and loves to play outdoors on the wide, west coast. Her passion for healthful activity and desire to constantly challenge herself have lead her to engage in a range of athletic endeavours from competitive ice-skating and professional dance to international fitness championships. Not one to sit still for long, she has also explored eco-adventure racing, surf-yoga retreats & trekking globally. Spending time in the water while wrapped in sunshine is one of her favourite ways to zen out… as is summer yoga at Kit’s beach.